This challenge gave me a much needed excuse to do something I’ve never done before – sew up a vintage pattern. I had a grand total of 3 vintage patterns in my collection that I’ve actually paid money for (and a few more that people gave me), so I pulled out those. Are you sensing a common theme in these 3 patterns? Apparently I had an obsession with this right angle kimono sleeve + yoke thing when I bought these! I liked the patterns in the middle and on the right the best, but they are also nowhere near my size and the simplicity pattern is exactly my size. I figured I’d make things easier for myself and just sew the one in my size rather than grade up for this challenge. 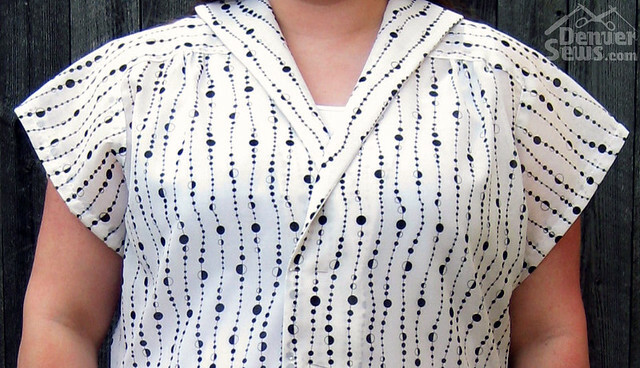 The pattern I made, Simplicity 1459, is a house dress from around 1945 (from my brief internet search), but I cropped it to be a shirt. The pieces came pre-cut without anything printed on them. I was a bit intimidated at first but this actually sped up my sewing by not having to cut the tissue. Once I figured out the language of the dots punched in the tissue from the instructions sheet, it was pretty easy to read. Two big dots indicated the grainline, 3 small dots meant cut on a fold, etc… I think I need to write the pattern number on the pieces though so I don’t get them mixed up – if I had two unmarked patterns out at once I’d never sort the pieces back out! You had to be organized in 1940. When I started on the instructions, the construction confused me a bit. First they had you attach the right corner of the yoke/sleeve by stitching 1/2″ in and pressing under, then topstitching to the bodice. I would have just sewed them together like a normal seam and clipped and pivoted as I went, but I gave it a try. Their method was probably more foolproof but took longer. Next when I got into constructing the rest of the bodice, I really did not understand the construction order. 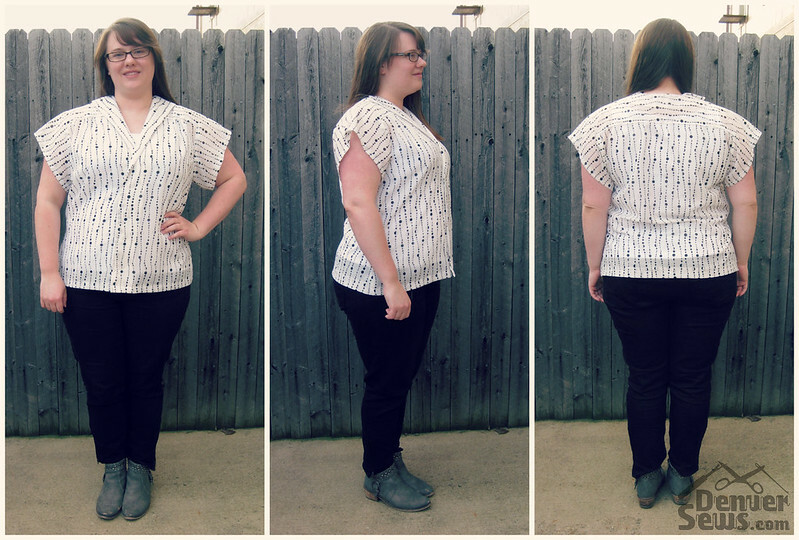 They wanted you to sew the side seams FIRST – what? Normally I’d do that last to allow for fitting. I read over the instructions several times and then finally realized I sew up magazine patterns with little or no instructions all the time – why do I care what the instructions say? So I tossed them to the side and just did it my way. I know Kitty said she liked finding interesting construction methods in vintage patterns… maybe I just wasn’t in the right mood at the time to be challenged. Anyways, here’s the final result. The fabric a gauze from Colorado Fabrics that feels like maybe a cotton-poly blend because it’s kind of scratchy. I feel pretty blah with the whole thing. If you’re wondering why you don’t see buttons… I confess it’s just pinned. I got to this stage and decided it wasn’t worth wasting my buttons. It isn’t looking as bad in the pictures as I think it looks in person, but it feels frumpy. Like a house dress, I suppose. Part of the problem is that the bust gathers (actually I converted them to tiny pleats because the gathers didn’t look good in this fabric) are set way wider out than the bust apex. It looks that way in the envelope drawing too so I think it’s on purpose, but on me it makes baggy areas on either side of my chest. Not a good look. It’s hard to see in the photos with white fabric, but here’s a closeup. The one thing I did find impressive/interesting about this style is that the sleeves allow for a huge range of motion. I can raise my arms over my head and the bodice doesn’t move at all. I guess that helps for extreme housework, like when you’ve got to get that broom way over your head to get cobwebs out of corners. Some other things I don’t like about this pattern… with this style of collar that is only the front rolled over, the back is finished with a facing that wants to flip up every time I put the blouse on and is just kind of fiddly. The waist is too low, but that’s the norm for me so it’s my fault for not altering it. I should have straightened the side seams and taken the waist in later. Honestly, most of my unhappiness is probably just laziness and lack of fitting. With the bust gathers being too wide, I would have to deconstruct a lot to fix it and I just didn’t care to. I’m in a sewing funk. Maybe when I’m in a more constructive mood I’ll grade up the Marian Martin pattern and make it in a black and white striped fabric. Maybe. Jamie … I think we have the same fabric fairy-godmother. I also have this fabric from Colorado Fabrics and plan to make a housedress out of it. PS I’ve placed a request with the sewing goddesses to send you some mojo. Cheers. It’s different, the fabric print is nice. 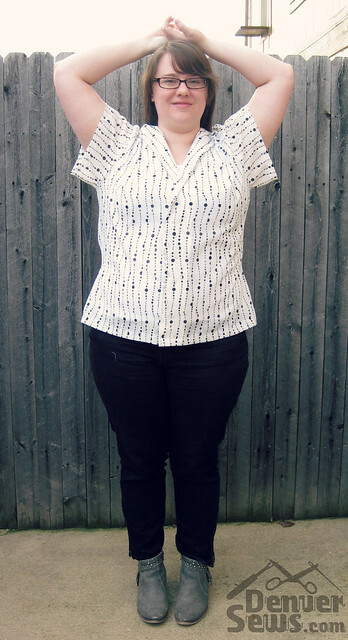 I agree with Lynne about your top working better as a sleeveless blouse. I think this style (with the sleeves) would be better in a flowing rayon type fabric. Then the sleeves would drape instead of standing up. I do like that you can raise your arms over your head and the blouse doesn’t pull up, so I think it’s a well drafted pattern. I had a Vogue pattern like that top and the sleeves were folded back/doubled. maybe it would look better that way. Otherwise it looks like it fits like the drawing–a loose flowy thing. Cute top but I agree with Lynne about the sleeves. Could you fold them to make a cuff effect. They just look out of proportion for the rest of the top. Interesting. I wonder what it would look like without buttons, just as a loose jacket. Interesting little blouse. I don’t think that sleeve style works well on you, even though it allows you to raise your arms up. Maybe it would be cute as a sleeveless blouse?